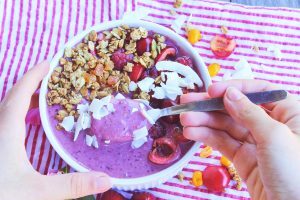 Here’s the perfect summer breakfast – a bright purple smoothie bowl made with blackberries, sea buckthorn and love. It’s tasty, beautiful and loaded with antioxidants. Sea buckthorn add a hint of tanginess and boost of vitamins and minerals to the smoothie bowl. A very unique flavour! I needed to take a while away from blogging. The break was good for me, but I’m starting to miss creating and uploading recipes to my blog. I’m returning now, and I hope it’s for good, but we’ll see what happens and what kinds of catastrophes I can come up with in my kitchen. I’m travelling to the USA in a couple of days with my family where we will be staying at an apartment in Orlando for a few days before going on a cruise and sailing around on the Caribbean Sea. Our vacation ends in Akumal – a town on the east coast of the Yucatán Peninsula – at an all-inclusive hotel close by the sea where we will be snorkeling among sea turtles and eating food all day long. Akumal literally means “Land of Turtles” in Mayan. Of course I’m looking forward it, and I’m going to take as many photographs as possible while I’m overseas. I’m also planning to write 3 blog posts about each part of our vacation here, but it’s not settled, yet. I’m hoping the vacation is going to help me de-stress, so I’m not going to pressure myself to write something if I don’t want to do it. I think that’s a long enough life update. At least for now. Let’s focus on the recipe, now, shall we? Funny story … this was actually a Blueberry and Sea Buckthorn Smoothie Bowl until this morning. I was ready to create the recipe. I had set up my camera. I had collected all the toppings. Then I opened my freezer to grab the frozen fruits, and I realised I didn’t have any frozen blueberries. A blueberry smoothie bowl. Without blueberries. So I grabbed a bag of frozen blackberries instead, I mean, what’s the difference? It’s blue or black berries. But the smoothie bowl actually tasted even better with blackberries, so maybe it was just the universe trying to tell me something. My grandma came by yesterday with a back of fresh cherries and raspberry blackberries (a cross between raspberries and blackberries. Rackberries? Baspberries? Sounds awful) from a local farmer, so I used those to top my smoothie bowl. I also used a few tablespoons of W.K. Kellog No Added Sugar Coconut & Cashew Crunchy Müsli and some coconut flakes. I absolutely love W.K. Kellog’s vegan müslies. 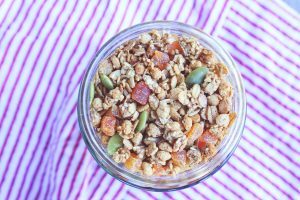 Sometimes you don’t want to make a batch of granola from scratch, and then it’s nice to have something at hand that isn’t total junk. The last thing I want to talk about, before I share the recipe, is my photography. I feel like that should be my thing. Not a lot of food bloggers talk about their photography, but maybe it can help someone to read about my mistakes. Well, today I used an actual bench as my background. Some people have faux wood vinyl backdrops (fancy) or whatever, but I don’t, so I’m forced to use the real deal which can be tricky. I placed the food on a pair of my own pants … the only problem with that was the sea buckthorn melted and left yellow stains on the pants which I had to wash off. But other than that, the photographs today turned out nicely. 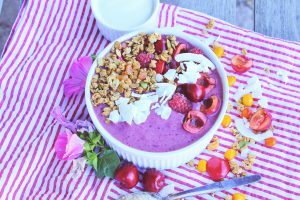 I liked the decorations around the smoothie bowl, and I gave it a very bright filter which gives it a very feminine look. I hope you decide to try today’s recipe. If you do, tag me over on Instagram. My profile name is @spirendeveganer. Also, leave a comment below! 1. Add the Blackberry and Sea Buckthorn Smoothie Bowl ingredients to a blender and blend until smooth. 2. 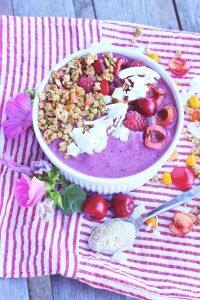 Pour the smoothie into a bowl and top it with fresh berries, granola and coconut flakes, or something else you’d like!